A dream come true for Frozen fans that might even persuade other family members to join in. 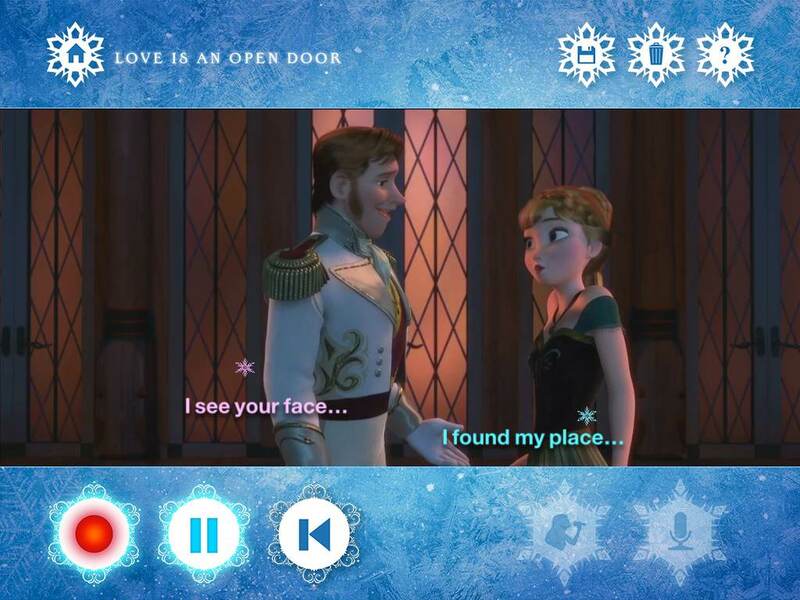 Disney Karaoke: Frozen is bound to delight frenzied fans of the popular film. Kids can watch film clips of all nine songs with lyrics and optional vocal tracks, then record themselves singing the catchy tunes. Devotees will enjoy making recordings so they can go back and hear their own voices as they watch the film clips. Downloading all the songs brings the total size to around 350 MB, with each saved recording adding a few more -- but we bet your little songbird will make the most of every megabyte! 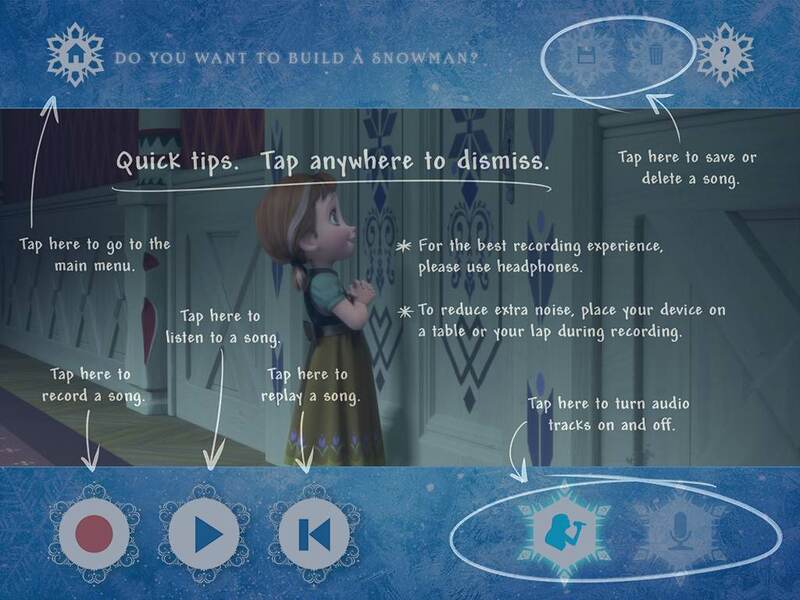 The app comes ready for kids to dive right into "Let it Go;" the other eight songs will be downloaded over a WiFi connection. 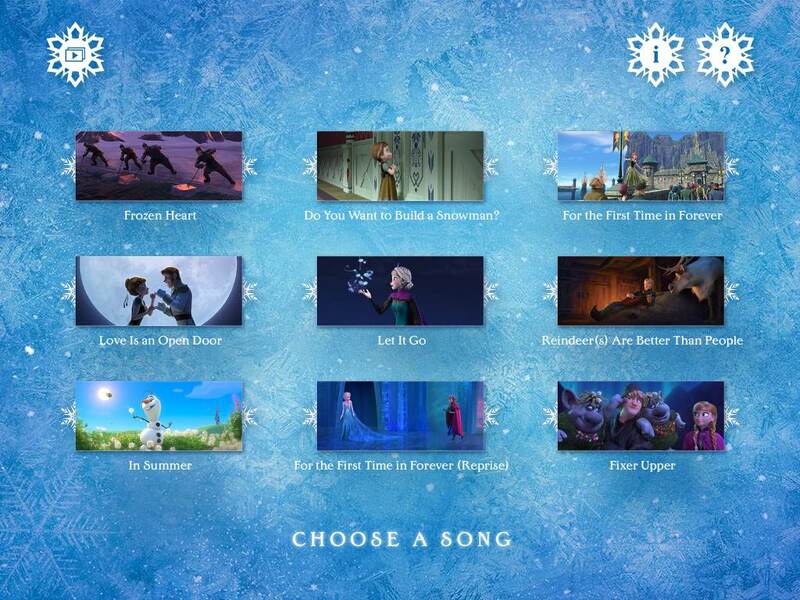 After selecting a song, kids can watch the full film clip with a snowflake dancing along the lyrics. Pressing "record" turns off the vocal track, so kids can sing into the microphone. Kids can then see how well they did by listening to their recording with or without the film audio and decide whether to delete or save the recording into a film gallery accessible from the main page. 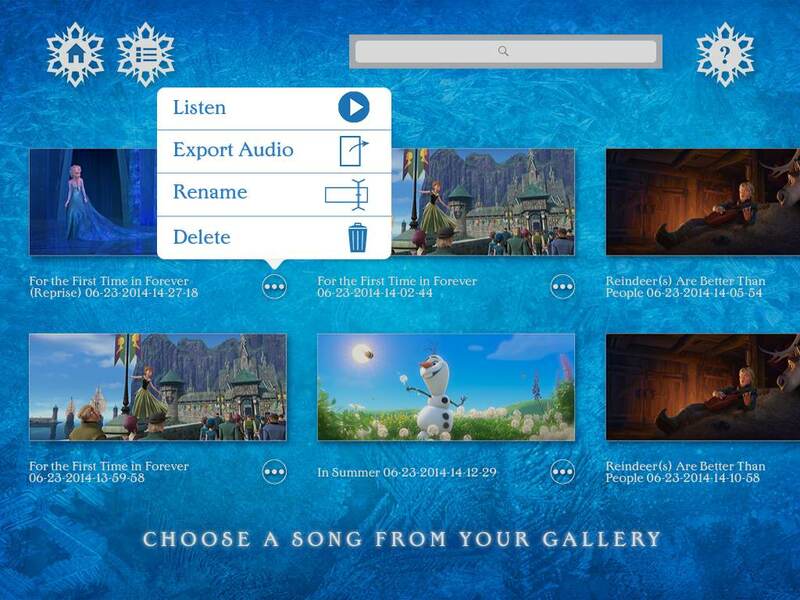 From the film gallery, users can rename, delete, or watch the videos with their voice and no lyrics, just like being in the movie. The recorded tracks can also be exported to an iTunes shared folder. As someone who wore out many a Disney soundtrack cassette tape with eyes glued to the tiny lyrics sheet, it's easy to see the appeal of this slick app. 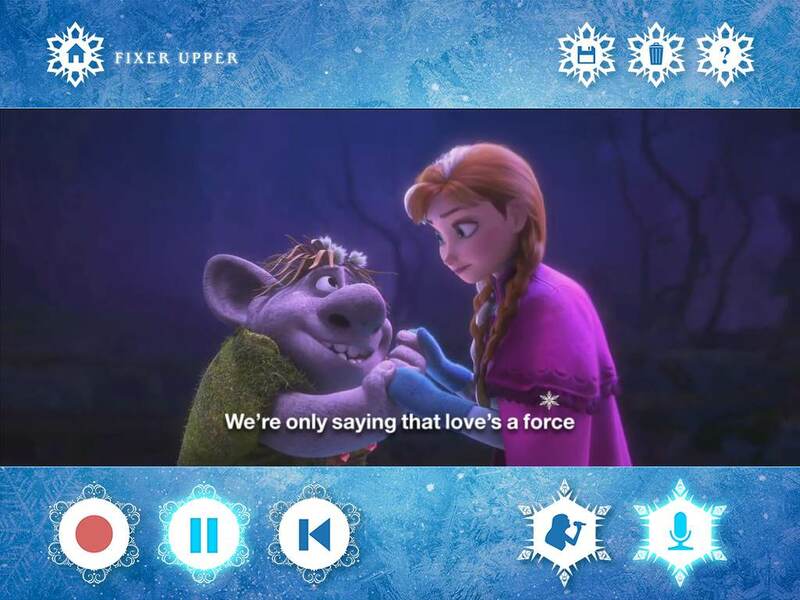 Frozen fans will love watching the clips again and again, and even the most tentative singers will find themselves humming along and picking up the funny and accessible lyrics. Duets show lyrics in different colors, so the whole family can join in the fun. The app is mostly intuitive with helpful tips. We commend the use of a parental gate, which uses an adult birth date, to keep kids from accessing the area to purchase more Disney apps. Break out this app for sleepovers, playdates, or a long (but not quiet) summer afternoon. 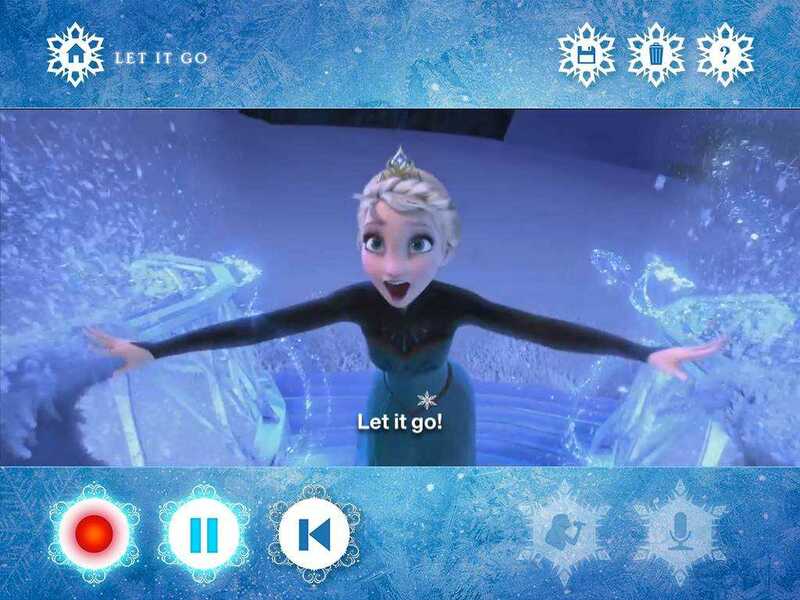 "Let it Go" is a challenging song, so try out the other tunes as well for fun characters and easier notes. Try dancing along to the music as well or acting out the videos to strengthen your memory of the lyrics and get the whole family moving together!